Adam London's afternoon comedy magic show provides family friendly fun! Make sure you don't miss out on these laughs! Book here today and get $16 Tickets! Comedic magician Adam London performs an afternoon comedy show filled with whimsy, sleight of hand and hilarity. 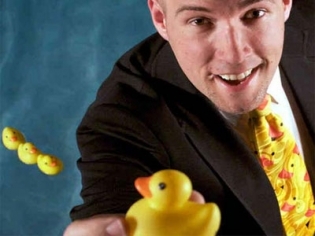 Adam London will make you have a just ducky afternoon with his magical comedy performed in Laughternoon. Known for his obsession with little yellow ducks, London incorporates them into a multitude of ways during his show. Humorous stunts, silly sleight of hand, audience interactions and stupendous magic tricks will entertain you and the whole family for a great low price. The venue is small and intimate, perfect for the number of volunteers and audience interaction that fuel the show. Adam London is a Las Vegas native and he has honed his skills at the many venues available to him throughout his career. This imaginative show is one of the best values in Vegas. I know he did try but this show was just wearing me out waiting for anything to happen. I laughed probably twice if that. When you spend your time looking at the time aching to leave you know the show is just too long. I was given free tickets to this show and still wanted a refund for having to sit through it. The one thing I can say I enjoyed was leaving. If he wants to make it worthwhile, stop talking about how bad it is to work the afternoon, why you aren’t a star on the strip. Most of his time was spend observing how it?s all so unfortunate for him. The audience doesn?t want to hear self deprecation as the main part of an act. But Adam spent much of his time doing just that. The humour was very amateur, the magic was very limited. Overall I would avoid the show and just enjoy walking through the Fremont street experience. Better entertainment there and free. Adam London was hilarious. Its perfect for kids and adults alike. The prices are reasonable to a good laugh. If you are in need of a laugh, go here! This was a great performance! The humor was so suitable for the audience, the adult humor was perfect for adults and the kids humor was perfect for kids. I really liked that Adam interacted with the audience so much. Not only was Adam’s magic impressive, but his personality really made the show quite memorable. I definitely recommend seeing it!